The Three Jewels of Buddhism are three areas we turn to for refuge. 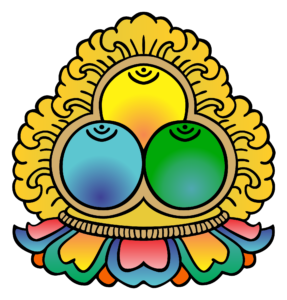 The Three Jewels, or Three Refuges, are essential to the Buddha’s teachings. In the Buddha’s time, when people wanted to ordain and become Buddhist, they formally took refuge in these Three Jewels. The Jewels are places we turn toward in order to cultivate mindfulness and loving-kindness. They are three different ways in which we may take refuge in our path and practice. The first of the Three Jewels is the Buddha. When we hear the term “Buddha,” we often think of the historical Buddha, Siddhartha Gautama. However, taking refuge in the Buddha is less about the man who awakened and more about taking refuge in the buddha-hood within us. The Buddha taught that we all have the seed of awakening that needs to be watered if we are to liberate ourselves. Taking refuge in the Buddha means turning toward this buddha-seed within. We tune into the seeds of wisdom and compassion already present, cultivating these qualities and resting with them. The second of the Three Jewels is the dharma, or way. The dharma is both the Buddhist teachings and the actual actions associated with the teachings. The Buddhist teachings offer a safe place, a safe way of being. Taking refuge in the dharma means we study the Buddhist teachings and put forth the effort to utilize the dharma in our lives. We meditate, take the precepts, and cultivate wholesome qualities. Acting and living in this way is a true refuge in that we do not cause harm to others or ourselves and are able to find safety in the teachings. The third of the Three Jewels in Buddhism is the sangha. The Pali word sangha refers to the community of practitioners. Traditionally, the sangha is the community of monks and nuns. For laypeople, a sangha is simply a community of people on the path with you. It may be members of the local meditation center, friends you have made in your practice, or those that you sit on retreat with. To take refuge in the sangha is to engage with the community of meditators. Community is important in Buddhism, as it is in many religious and spiritual traditions. Our meditation practice is often personal and intimate, but engaging with others is just as important. When we turn toward the sangha, we are able to learn from others, offer help to others, and use our practice to engage with others mindfully. Practicing with a community often helps us see things in new ways or consider things which we had not previously considered.